The first mountain and its rock walls that attract runners, mountaineers and climbers from around the world, including various routes for hikers and bikers, the rushing streams meeting of kayak enthusiasts and canoeing: this is the Valcellina: a paradise for lovers of nature and sports, a lively gym immersed in an unforgettable scene. Leaving Pordenone, capital of Western Friuli, which is reached via the A4 Torino – Trieste and the A28 segment that connects to Portogruaro, you head north, crossing the high plains near Pordenone up to the foothills, enjoying continuous skyline changes. We arrive so in the municipality of Montereale at the foot of the Friulian Dolomites, natural and main entrance of the Cellina valley. The whole valley came out of the secular isolation only in the early twentieth century with the realization of the road that joined the Pordenonese with Barcis and with the improvement of roads also through the Passo S. Osvaldo and Erto-Casso towards the alta valle of the Piave. Going up the valley we meet the village of Andreis. Very impressive the old “crossroads” of SS251: between protected galleries and cliffs, the waters of the streams of the Alba and Molassa rivers clash with those of the Cellina forming an exciting phenomenon of erosion, “Marmitte giganti.” Andreis is characterized by houses with ancient wooden balconies, exterior stairs, walls of rocks that identify a true architecture called “Andreana”. Coming out of the last tunnel, suddenly the horizon widens Barcis with its lake, the Horse Group and the impressive Crep Nudo seem to soften the edges. Going up the river Cellina, however, the road starts winding its way up to the great plain of Porto Pinedo, sunny plain originated from natural gravel deposits at the junction of the Cellina and Cimoliana streams, in the past, “Porto” was the center of the river market for transportation and timber trade for Venice. At the eastern edge of the great plain is nestled Claut on a green valley originated by the confluence of streams of Cellina and Settimana. All around the country offers beautiful scenery as a setting of forests and Dolomite mountains. History indicates the Lombard period the date of birth of this community. The other center that we can find in the Northwest is Cimolais. The heart of the Parco Naturale delle Dolomiti Friulane. Beautiful mountain village that has many natural attractions among which stands inevitably the Campanile di Val Montanaia. From Cimolais the road goes up and through the woods of Passo S. Osvaldo you can reach the towns of Erto and Casso. The finds from the Roman Age testify the ancient origins of Erto unlike Casso whose origin is certified by the fourteenth century documents. These places lead and will lead to permanent reminder of the tragedy originated October 9, 1963 by the landslide of Mount Toc in the basin of Vajont. From Erto and Casso SS251 thence expressing almost a sense of sadness, through the debris of the disastrous October ’63, towards the valley of the Piave reaching Longarone. The wild and unspoiled Valcellina, with its people, its traditions and customs, is proposed as a jealous guardian of a heritage of great value that only a few are fortunate enough to know and above all to live. The Val Tramontina (Cjanâl of Tramonç in Friulian) is a valley of the Carnic Alps. It is located in the province of Pordenone, in the north-south direction and is crossed by the river Meduna. In the valley are the municipalities of Tramonti di Sopra and Tramonti di Sotto, and at the mouth of the river on the plain, Meduno. 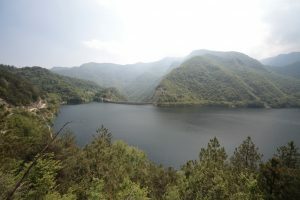 Among Meduno and Tramonti di Sotto is the artificial lake of Tramonti (or Redona, the name of the hamlet overlooking its banks). From its waters, during periods when the lake level is lower, emerge still today the picturesque stone buildings of the old villages submerged by the creation of the dam on the river Meduna. The mild climate which is, in summer, in the areas of Chiarzò and Meduna allows bathing in the three municipalities. The valley has a natural heritage of outstanding beauty. For hikers and cyclists there are many paths to the lakes of Tramonti (Redona, Selva Ca, Ca or Ciul Zul), Meduno, in Campone, in Tramonti di Sotto, di Mezzo and Tramonti di Sopra / Rest Pass Tramonti. The Monte Valinis (Meduno) is the perfect place for paragliding enthusiasts. Climbing “Tears of Rest, Val Tramontina” and via ferrata “From Tramontin” (Tramonti di Sopra). You can fish in three lakes and rivers Meduna and Chiarzò, canoeing on Lake Tramonti, caving in “Bus Castigù” Campone, walks with snowshoes in Tramonti di Sotto and Tramonti di Sopra. Located at an altitude of 550 above sea level, on the slopes of Mount Asio, it covers a brief plateau that dominates the entire plain of Friuli. The town can be reached easily by road Val Arzino and Val Cosa. The origins of the name Vito are rather uncertain, but it is very likely that the most exact etymology is Vicus (village) from where Vito. For the name Asio the origin is completely unknown. From the historical and political point is to remember that Vito d’Asio like everything in Friuli was occupied in 1420 by the Venetian Republic, who ruled it for nearly four centuries by the lieutenant of Friuli, who resided in Udine. The villa Vito was mentioned for the first time in a document of 1220 and subsequent mind in an act of the Earl of Ragogna in 1260. 09.29.1642 The Vito d’Asio is formed a free municipality, the first in Spilimbergo, with statute in five chapters. The Church of San Michele Arcangelo di Vito, first mentioned in 1436 was remodeled in stages, became chaplain in 1581 and was erected Parish September 24, 1890, detaching definitely from the Church of San Martino. In 1493 it was enlarged the parish church of San Michele Arcangelo and formed the oldest brotherhood of Pieve d’Asio, the San Gottardo. High 800 meters above sea level, Mount Zucchi is a vast undulating plateau that dominates the country Anduins, with abundant woodlands, connected to the town by a convenient asphalted road. In this framework we are now arising pretty cottages used by tourists and locals for summer holidays. The votive church built by the people of Anduins after the war, dedicated to the “Madonna della Neve” (which falls on August 5) complete the tourist interest. The mineral water from the Anduinssource contains an optimal curative doses of sulfur salts, magnesium, calcium and silicon. Since 1872 a scholar described the efficiency of water as an antidote for many common diseases, calling it a “wet healing treasure”. The mineral water treatments and bath therapy made possible by these waters, promote the great tourist development of the country and the entire Valley of Anduins Arzino. There are now deep and important studies to strengthen and expand the therapeutic possibilities with modern facilities and adequate technical means. The village of Casiacco is, next to neighbors Flagogna and Colle, the industrial triangle of the Valley, and its flat morphology favours the establishment of industrial and commercial establishments, which provide employment to the people not only of the municipality of Vito d’Asio, but also of neighboring municipalities. Because of its important function the plain on which stands Arzino, having abandoned its winding course, relaxing in a flat, before flowing into the Tagliamento. The country develops along the road that passes through major artery of communication with neighboring towns of Sella Chianzutan and Carnia. The center of Casiacco consists of a large square, a meeting place of the villagers during traditional celebrations. The natural beauty of the country is given by the green woods that surround it and in which it is pleasant To advance. San Francesco 400 mt. over the sea level, relax on the large basin which opens Arzino Upper Valley. Touristically already known, this area continues to offer an image of hard-working and peaceful life. wooded slopes offer walks that rise to Giaf houses, the Givoli hut, the Forca Armentaria, Palar and Pozzis. Place in contact with the Carnia, it is the natural port of entry through the scenic and Valley Preone, but especially with the pass of Sella Chianzutan that opens from its 954 mt. on Tolmezzo and the whole Carnia. The ancient agricultural vocation of St. Francesco is the constant guarantee of active presence in this wonderful channel. After the earthquacke there was a renovation of the villages, without changing the characteristic physiognomy. The fervour of the work imposed by the reconstruction, seems to have temporarily buffered the hemorrhage of emigration. While increasingly gaining the tourist vocation, St. Francesco is found to assume the role of bridge to the Carnia, which he feels bound by the same ancestral traditions and accents. The summit of Mount Verzegnis, which from its 1915 mt., Above Teglada, Valcada and Piombada, is the yard of the white flag of snow that stands between the two valleys. On the meadows below, cross sunny drunken skiers, while on the slopes Piombada contrails slalom skiers leave on serpentine twists gleaming snow. A 560 mt. over the sea level, Pielungo is the heart of many villages of which is studded average Arzino Valley. Pert, Chiamp, Cervedol, Juris, Oven, Cedolinis, Oltrefoce, are all villages which, among green woods and meadows, they found their own space on the hilly slopes that descend from Monte Pala and Mount Cecon increasingly rapid degrading on Foce and Arzino, a paradise for lovers of trout and fresh and clear waters. 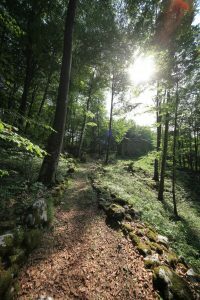 Ancient mule tracks and easy paths lead hikers to the pleasant discovery of corners that smell of mushrooms, for him to breathe the air in alpine pastures of Albareit and Jovet, to take him to climb among rocky formations of the Monte Rossa or Mount Flagel that bloom edelweiss and gentian. New and improved connections between the villages are building a network of forest roads among the most evocative of the region. The revival that followed the earthquake of ’76 is almost completed and has helped to make the most welcoming country, thus promoting the periodic return of migrants and tourist accommodation. A tennis court at the Ceconi Castle, has given an initial response to the recreational needs of young people, many during the holiday season. 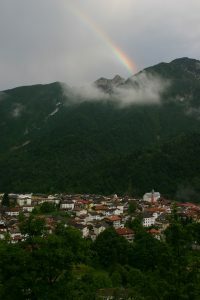 Meduno is one of the oldest centers of the mountainous area and foothills. It dates back to prehistoric times. One of his earliest evidence is the CIAGO stone, a huge block of stone, called “Piera de l’aga” (stone from the water), was attributed to the pre-Roman: perhaps the sacrificial altar of a Venetian population. The town has developed at the foot of the castle built in 1136 on the homonymous hill from the Meduno family, vassals of the emperor of the Holy Roman Empire of Germany. Later (between the eleventh and twelfth centuries), the landmark became the parish church; and the development of the town took place lower down, near the church. The fortifications, such as churches and houses of this village have always been built in stone, in a creative and working capacity, as well as technique, which were exported all over the world by the people pushed over time to look for work abroad in other Italian areas. One of the most important examples of the construction of this part of Friuli is made from the ancient parish church, rebuilt in 1830 and restored after the serious damages caused by the earthquake in Friuli in 1976. It was recovered the backbone; neoclassical style, and some precious works: the baptismal font (1495) by Giovanni Antonio PILACORTE, the altarpiece of the Madonna and Child from eighteenth-century Venetian Gian Battista Piazzetta, and other minor works have been saved. Significant historical are also the churches of San Pellegrino, in Navarons, and St. Martino, in Castello, dedicated to the fallen of all wars. Another landmark for the history of Meduno is the Colossis building (XVI-XVIII), home of the homonymous family, prior property of the diocese of Concordia. For years, the building is used as the seat of the municipal offices and the mountain community. Most likely is the result of the transformation of the castle (XI-XII), of which there is no trace. Significant expression of Meduno story is also the Museum of the Risorgimento, in the hamlet of Navarons, dedicated to audacious motions Risorgimento of 1864, in which the protagonist was and the doctor Antonio ANDREUZZI with his son Silvio and other patriots who badly paid their ideal of freedom and independence, in the nameness of the territory, which belonged to the Austro-Hungarian empire. In the activity have wide cultural space connections to local history, which is rightly one of the leading protagonists of the poet and writer Novella Aurora CANTARUTTI, author of many works in the Navarons Friulian dialect. A strand powered by new authors, such as Ida VALLERUGO, nationally recognized poet. You can admire the wonderful nature trails between Val Meduna, Valle del Muie towards Val Còlvera to reach the small Forchia Meduno (m 657), from here the road continues to campone of Tramonti and Malga Valinis in the Friulian Dolomites Park, from where you gain the summit Valinis, it is 1102, with a spectacular view. The municipality of Clauzetto includes forty scattered agglomerates, as Celante of Clauzetto, Dominisia, Francescuz, Gerchia, Orton, Pradis di Sotto and di Sopra, Tascans, Triviat, Zuanes. In a nice area in the balcony on the plain, it is the center not only of ancient cultural and economic tradition (attested by both the respectable number of famous people who were born here, both from the many buildings – like the CONCINA palace – symbols of wealth and taste) but also established tourist vocation. 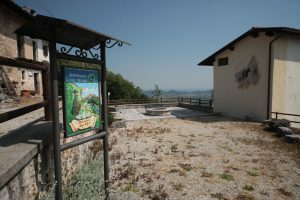 Clauzetto can rely on its tradition of hospitality and the great natural heritage, enjoyable through a network of pleasant roads and trails: the landslide phenomena and the deep ravines of erosion of the Cosa and Paveon; the percent of Gerchia plateau features (sinkholes, chasms and caves, as the complex La Val – Noglar – Mainarda, a hundred meters deep, with growth of 6.5 km); the gullies of the mountain Dagn; springs scattered a bit ‘everywhere, but especially the Greens, tourist equipped caves, where you can also give appointment to the Christmas Midnight Mass, has long become a tradition. Pradis features are the houses, the small cemetery of the Italian-German war on the way to Pielungo (where they fought on 5-6 November 1917, during the Italian retreat from Caporetto); the local Speleological Group for the Museum of the caves finds (Epipaleolithic and Neolithic).